USPS Priority Mail Express is a guaranteed way to send documents and packages to a destination overnight or in one to two days on any day of the year, including Sundays and holidays. If the US Postal Service doesn't deliver your package on time, they will refund the full delivery cost to you. Items under 70 pounds can be sent through Priority Mail Express to any address in the United States. Priority Mail Express comes with up to $200 in insurance and delivery tracking for free. USPS is the only overnight shipping carrier that is allowed to deliver packages to a P.O. Box address. Other carriers, such as UPS and FedEx, are not able to deliver packages to mailboxes in the Post Office. USPS uses zone-based pricing for Priority Mail Express. There are 9 zones in the United States. Prices are based on the distance from the original package location to the delivery destination. Prices start at $25.50 and up at the Post Office and $22.68 and up for Stamps.com customers. Additional fees apply for packages that must arrive on Sundays or holidays. Priority Mail Express must be marked with pre-printed stickers or boxes from USPS to ensure that they arrive at their final destination quickly. USPS offers free Priority Mail Express Flat Rate envelopes and boxes which bear the Priority Mail Express symbols, which you can order for free through the Stamps.com Store. You also can order free Priority Mail Express stickers, which you can place on your own packaging. You can legally send small envelopes through Priority Mail Express, but it's not recommended because the required form is often larger than the envelope and can become separated during delivery. Instead, drop the little letter into a larger pre-printed Priority Mail Express envelope to ensure that your item arrives safely. Additionally, you can add other USPS services such as COD service and Return Receipt for your Priority Mail Express parcel. 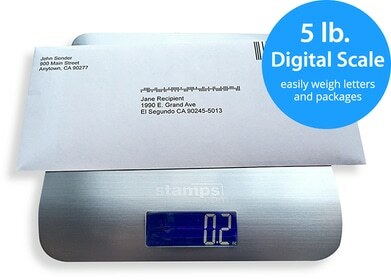 Priority Mail Express Rate Discounts: Stamps.com customer can enjoy discounted rates on Priority Mail Express that are not available at the Post Office. As a Stamps.com customer, you’ll get up to 14% off retail Post Office rates for Priority Mail Express shipping. Free Package Pick-up: If you don’t feel like going to the Post Office, you can set up a free package pickup at your home or office by a USPS carrier through Stamps.com. The software makes it easy for you to schedule a free carrier pick-up of your Priority Mail Express package with just a few clicks. Easy Zone-Based Pricing: With the USPS utilizing zone-based pricing for Priority Mail Express, determining what zone your delivery location is located in and what shipping price to pay can be complex. The Stamps.com software automatically determines the correct zone-based pricing for your package by instantly accessing the USPS database, preventing you from ever overpaying or underpaying the shipping fee.